SF Inspiration #1: Change is happening all the time – Discover the signs! Change is happpening all the time. A statement that is widely accepted nowadays in our fast changing world. Yet, do we really understand what it means for our everyday life? Do we see the potential this view offers? Hardly. Then if change is happening all the time, stability is an illusion or at least an exception. Most concepts used however are still based on the idea of stability. Or did you know that if you believe that change is happening all the time neither the classical problem solving method nor the saying that “people cannot change” does make sense? And the idea of people “having” a personality, character or any other inner structure are highly questionable. 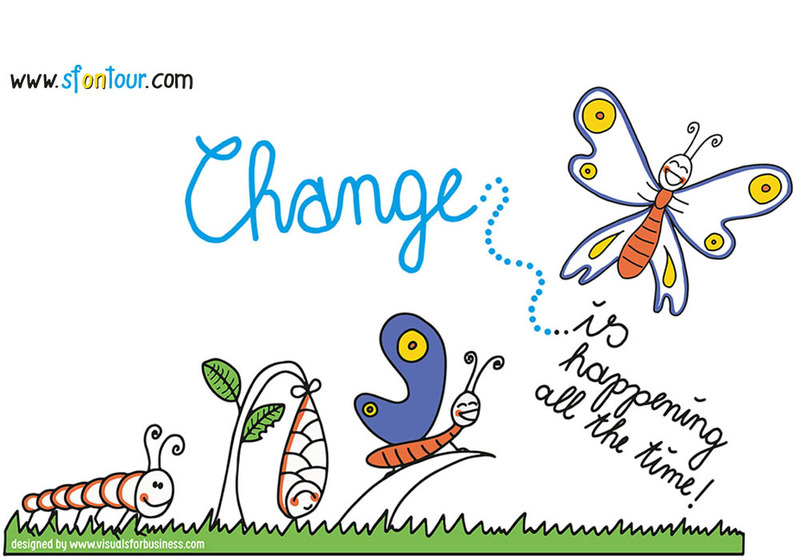 Your perspective on change makes a difference – discover the signs. Change – two contrasting ideas with a huge impact! 1. Change is the rule – Stability the exception! Already Heraclitus embraced the idea of change happening all the time. In this view everything is changing, nothing is constant. The water in the river and thus the river is different every second. Change is the rule and stability an illusion or at least an extreme exception. In this view you don’t have to do something to change, because change is happening anyway. At best you can influence change in a certain direction. If you look at a toddler, for example, you see this very well. Bibiana, our daughter, grows every day. She learns constantly. On one day, she eats salad, on the next day, she doesn’t. As soon as we as parents have the idea that we now figured out how it works, she is behaving differently. Change is obviously happening all the time. If you look at yourself, you will notice that no day looks exactly the same. You will notice that during the day, you feel different, e.g. you become hungry or feel happy or angry. You meet people that inspire you. Your surroundings change, your relationships change, etc. Did you know that your body is constantly replacing old cells with new ones at the rate of millions per second. By the time you finish reading this sentence, 50 million of your cells will have been replaced by others. You are physically another person now. Wherever you look, you can see this. Most changes are very small though and only noticable when you look closely. Look around in the room you are in at the moment: How many things, e.g., do you discover that are laying at a different spot than yesterday evening? Or how much change do you notice that is happening at this second, e.g. people walking around, emails popping in at your inbox, thoughts coming and going, new ideas emerging, cars driving by, solutions arising…? 2. The idea of stability is a persistent one! “We already know that!” might some of you say. “What’s the big deal?” Here it comes: Even though the above view has become more popular in the last few years, there is still this very persistent and contrary idea that stability is the norm and change is the exception. Consider, e.g., the classical problem solving method: How many times have you tried to analyze a past problem as if everything was still the same? Or how often have you heard yourself say that “things are like they are.” Or think on concepts of personality or character: How many times have you been told that you “have” your personality or your character, and that it cannot be changed that easily? that is rather done than is happening. Often even so, that the idea is promoted of people having to do something “forcefully” to change this stable situation. Like Wittgenstein said, “uttering a word is like striking a note on the keyboard of the imagination.” The use of the word “stability” in our language is often connected to the physical picture of stability: How can you change a stable rock? You have to use force and (at least partly) destroy it. Even tough most people will admit that the world around them is changing fast, most of us still use concepts of a former world where stability seemed to be much more present. “So what?” you might ask. Is this difference really relevant? Yes, very much so. This fundamental philosophical question has dramatic effects on our everyday life. 3. Look out for signs of progress instead of analyzing “stable” states! This difference of perspectives can make a big difference, for you and your surroundings. (1) no situation that stays the same. As soon as we start analyzing it, it’s already a different situation. It’s much like analyzing a cloud. As soon as we start to describe it, it’s already looking different. This difference gets even bigger as time passes by. (2) no stable root cause that leads to situations. In a complex world a multitude of interplaying influences that also change all the time are much more realistic. (3) thus a very high probability that your ideas of how to “fix” the (past) situation, don’t fit the actual changed situation. Look for signs of progress instead: The more you embrace that change is normal, the easier it is to live a life in ease. If you feel stuck, it’s a hopeful perspective to know that things will change again and to look out for signs of what’s wanted. If change is happening all the time, your wished for change might already (at least partly) have happened in the past or might happen in the near future. So look out! People who tend to see stability as the norm mostly miss these tiny signs of progress. The more you look out for useful changes that happen all the time, the more you will find them and the easier you can amplify them. Think of something that you would like to have different in your life. When did you already experience these 25 signs of progress – partly or fully – in your life? What was useful then? What is the potential of this view on change for you? What differences did you experience between this quest for signs of progress and the typical problem solving questions, like “What is your problem?”, “Why is it how it is?”, “Who is responsible?”, etc.? How could this change in perspectives enhance your life even more? What potential do you see in this view? Imagine the differences this shift in perspectives could make! Imagine a world where we would all talk more about signs of progress that show us that we are moving in a wished for direction instead of lamenting the past. What differences could that make for all of us? What differences could that make for your family when you talk about how you could notice tonight that you all had a great day? What difference could it make for you to think of signs that could show you that you are moving in the right direction? And how probable is it, that once you identified them, you will see them happening more in the future? Imagine a world where we would all look for signs of the recent past that encourage us that we can do steps in the wished for direction instead of lamenting what doesn’t work. Wow, how would our newspapers then look? What difference could that make for our company when we talk more about what worked and how we could use that in the future? What difference could that make for our projects if we learned to amplify what worked? What differences do you think could this shift in perspective make? We are curious to hear from you! Thank you for joining – www.sfontour.com – the journey to a life in ease and joy! Together we amplify useful changes in the world! SF Inspiration #2 is soon to come – register for our newsletter to get the news! Change is happening all the time; our role is to identify useful change and amplify it. Love this Bateson quote. I think amplifying useful change is the art of therapy, coaching, organizational development, or personal relationships. As SF practitioners, if we are experts at anything, it is at noticing. Just today a 5 yr old and her mom were surprised by the simple yet effective strategies the little girl was already employing to feel more calm and ‘ok’ vs “she has excessive anxiety” I noticed these little occurrences and amplified them by asking her to show me more through her play activity. Mom was stunned at how capable her daughter is and so relieved. The useful changes were already there, I noticed, wondered out loud, and put a magnifying glass on useful change so they saw it too. What fun. I have a half dozen stories daily! Thank you very much, dear Pam. What a great example of the power of noticing and amplifying what already works! Yes, yes, yes, dear Pam!